One of the unfortunate side effects of working with children is that it forces you to become familiar with some of the bizarre things they like. Happily, there are some of them who know that Batman is the best superhero, or that Belle and Jasmine are the ultimate Disney princesses. But alas, there are others who enjoy foolish things like Angry Birds or Snow White or *shudder* Justin Bieber. It wouldn’t be so bad if the entertainment for kids today weren’t so mind-numbingly rubbish. I’m sure everything was better when I was young. Still, if I have to be bored by kids’ culture, I always try to bore them a bit in return: the book shelves in my school have recently been boosted by a collection of Geronimo Stilton stories. (For anyone lucky enough not to know, he seems to be a mouse that runs a newspaper.) Whenever any of my students borrows one of these books, I always ask them if they know what Stilton means, and tell them about the stinky blue cheese that I love so. Their reaction when I talk about blue cheese is much the same as my reaction when they talk about Angry Birds – but I didn’t care for strong cheese as a child either, and it’s not like they have easy access to it in HK anyway, so we can but hope they will learn the error of their ways. 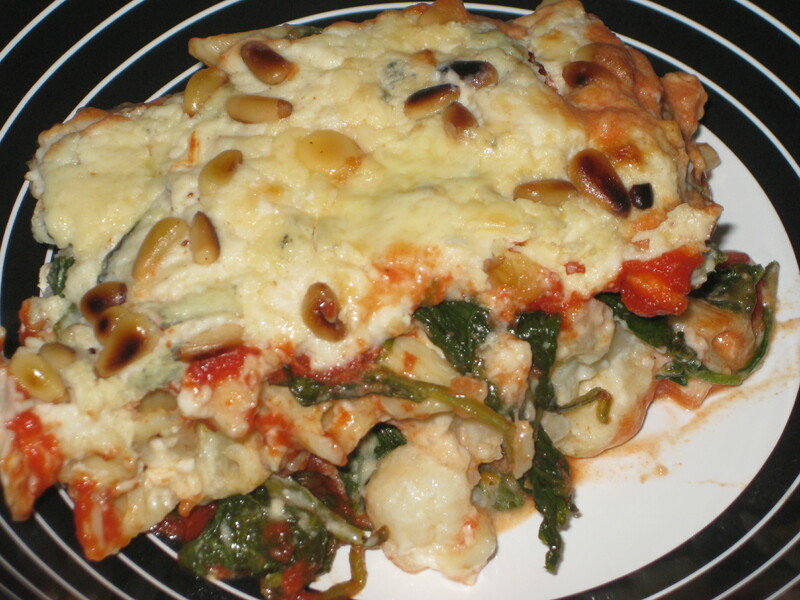 And here is a pleasant way to eat Stilton – the cheese, not the mouse. 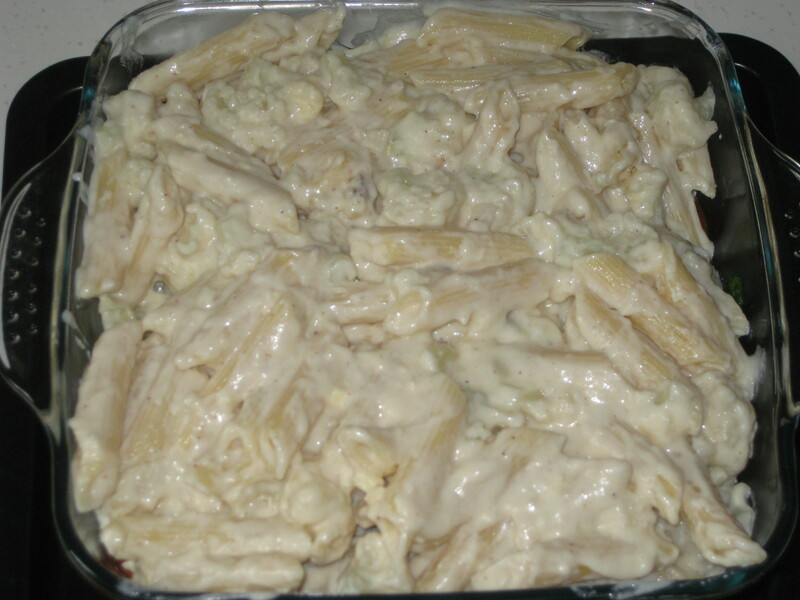 This is a really hearty dish, a bit of a mixture between cauliflower cheese and macaroni cheese, with various other goodies thrown in, including blue cheese on top. It looks quite smart made in individual pie dishes, but is good midweek fare when assembled in a big dish as I did this time. 1. Preheat the oven to 200C. 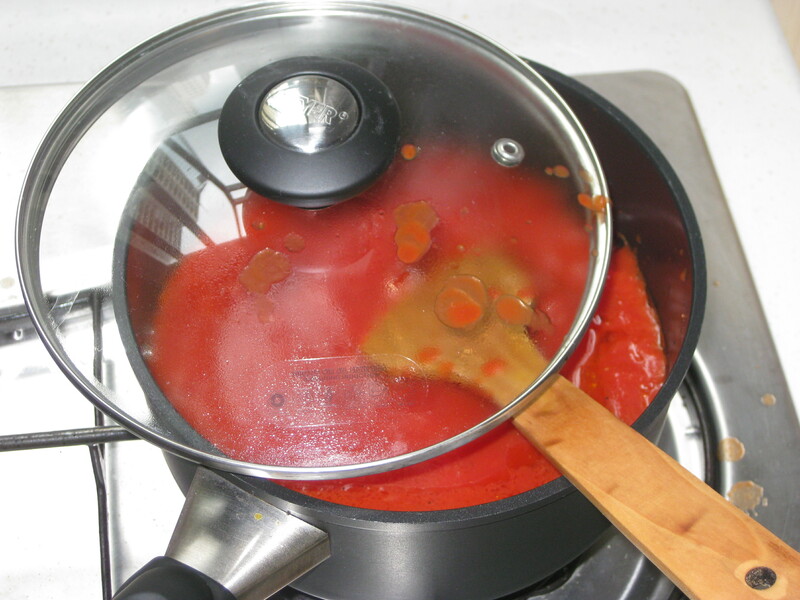 First make the tomato sauce. Heat the oil and fry the garlic for 1 minute, then stir in the passata. Season, half cover the pan, and simmer for 20 minutes. 2. While it’s simmering, start on the cheese sauce. Put the milk, flour and 50g butter into a pan. 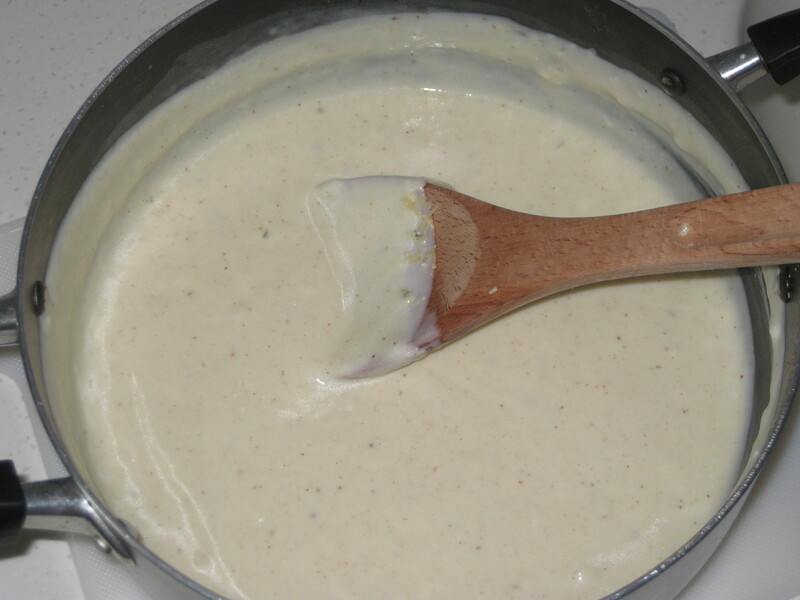 Heat gently until smooth, whisking all the time, then let it bubble for 3 minutes, stirring with a wooden spoon. 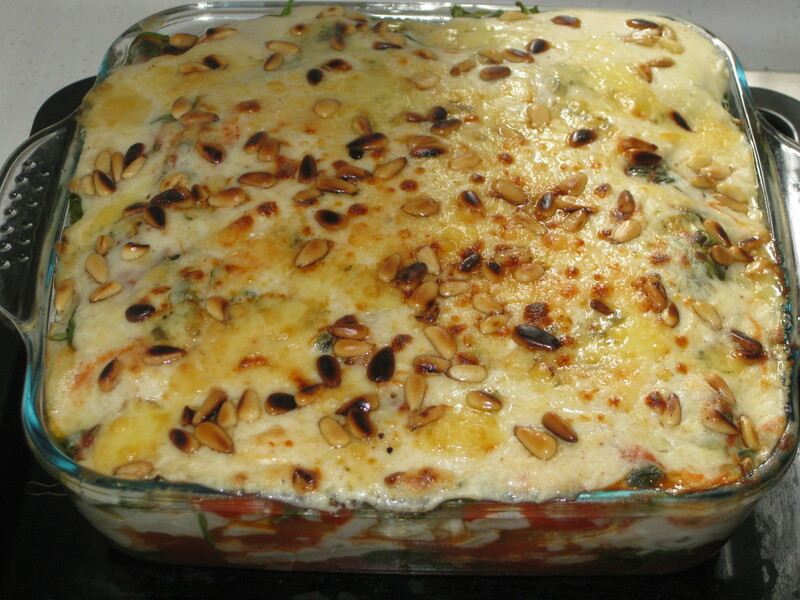 Set aside to cool for 5 minutes, then stir in the mustard, most of the cheddar, half the Stilton and the nutmeg. 3. 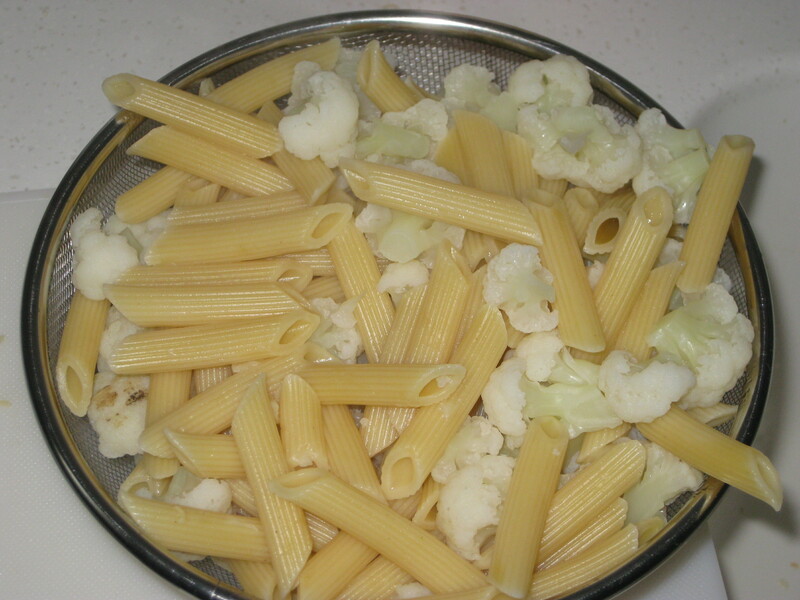 Bring yet another pan of water to the boil and cook the penne and cauliflower for 8 minutes, then drain. 4. 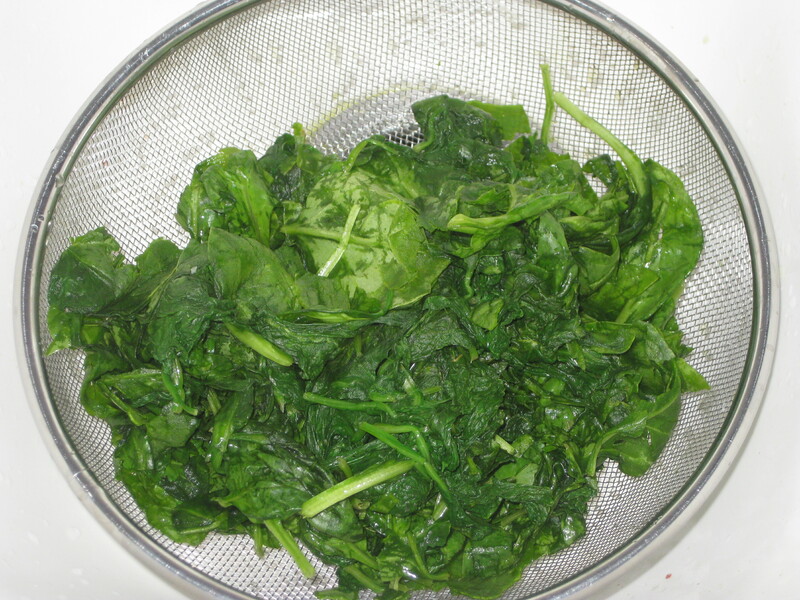 Pour a kettle of water over the spinach, allow to cool then squeeze out as much excess liquid as possible. 5. 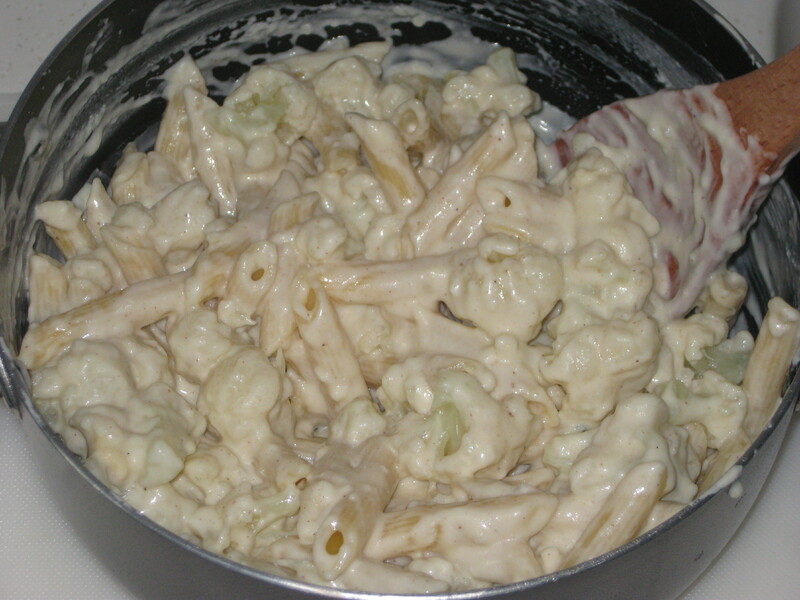 Set aside 300ml cheese sauce, mix the rest into the cauliflower and pasta. Fight the temptation to start eating immediately. 6. 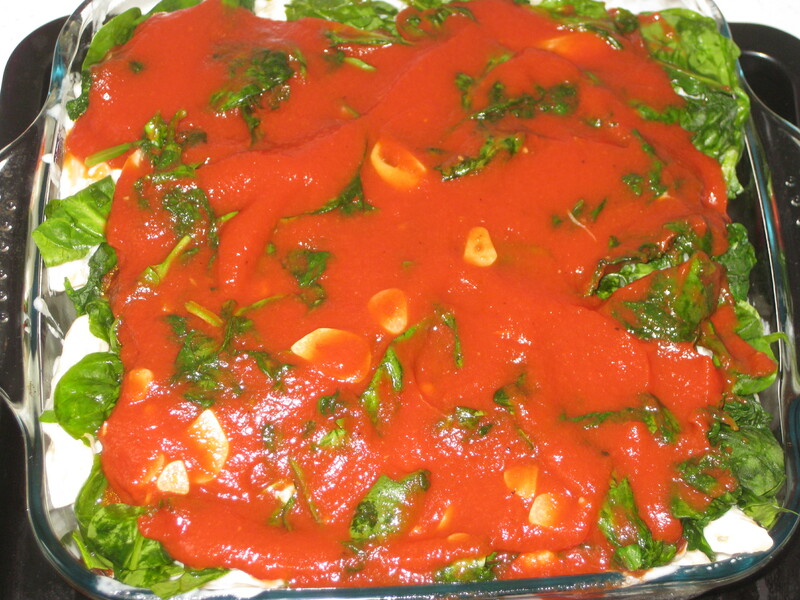 Pour half the tomato sauce into a large ovenproof dish. 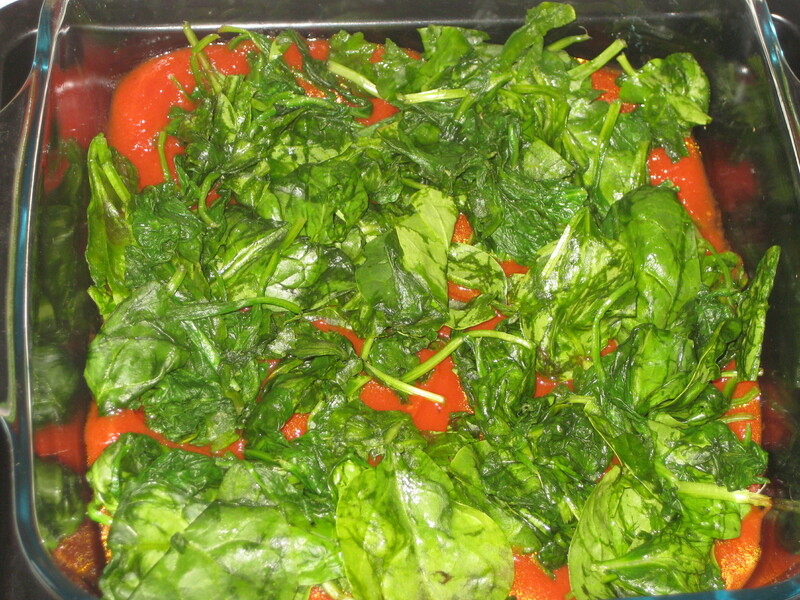 Top with half the spinach. Cover with all of the penne and cauliflower, followed by the rest of the spinach then the rest of the tomato sauce. 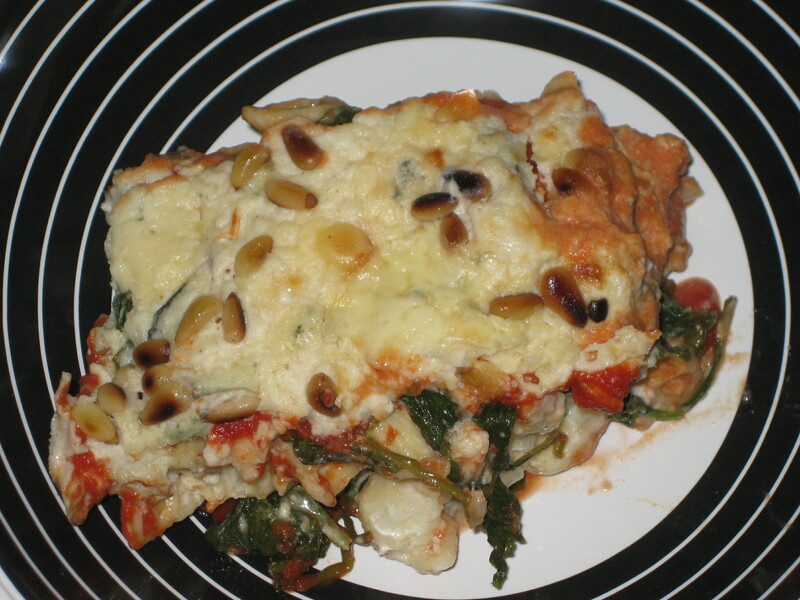 Top with the reserved 300ml cheese sauce, leftover Stilton and cheddar and the toasted pine nuts. 7. Cook for 20 minutes, then slice up and serve. 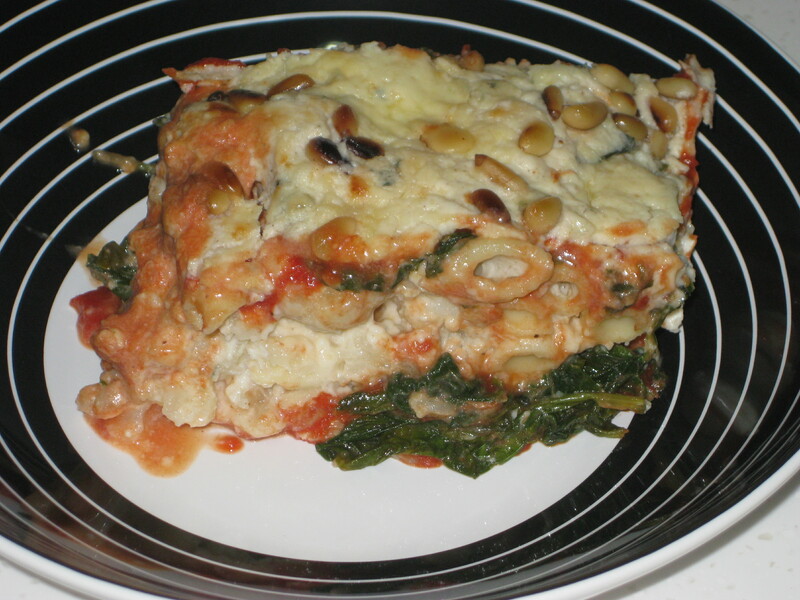 This entry was posted in Vegetarian Recipes and tagged cauliflower cheese, comfort food, pasta bake, vegetarian dinner. Bookmark the permalink. 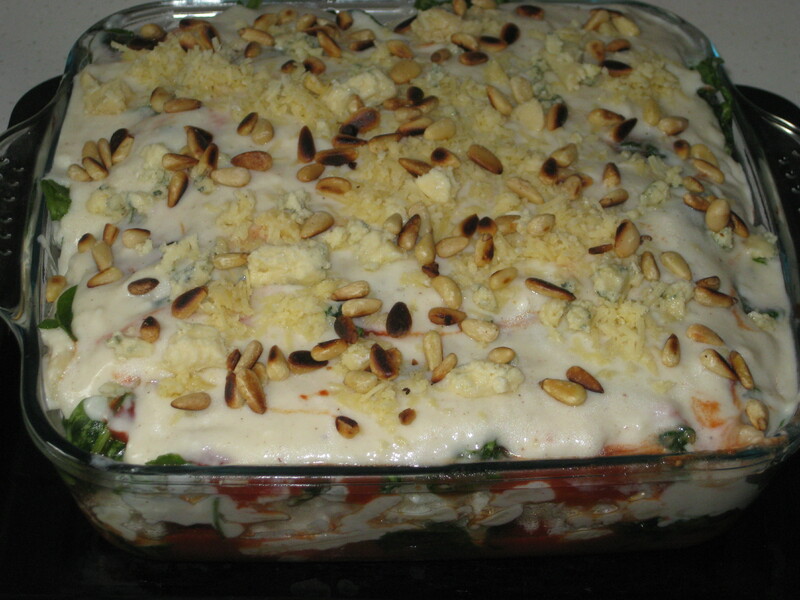 now this is a delicious pasta bake with veggies. your illustrative pics have made it more clear. Thanks, it really is a very satisfying dinner. 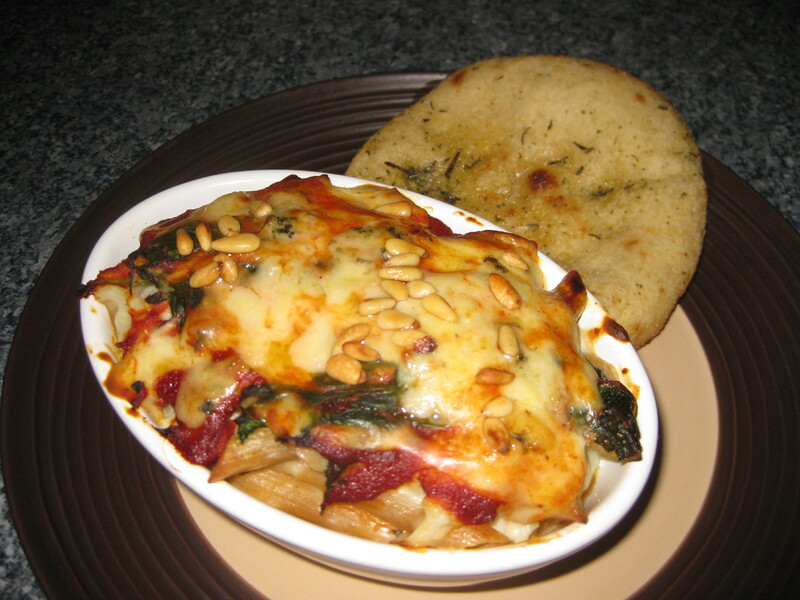 I love baked pasta dishes and this sounds and looks absolutely great. Pinning it to try it out soon! Great, let me know how you get on! Looks like a hearty meal! It certainly filled me up, which is no mean feat!